MAKEUP GEEK EYESHADOWS; SHIMMA SHIMMA, FRAPPE, COCOA BEAR, BITTEN & BURLESQUE. Makeup Geek is an American make up brand owned by one of the famous YouTubers' Marlena | you can follow her channel here.. On her YouTube channel she often shares videos of make up loos she's created, tutorials on how to blend eyeshadows, sneak peaks at the new products and a lot more. She seems like such a lovely lady and a very successful one at that. When I found out that BeautyBay was stocking their products I was over the moon and couldn't wait to purchase some of their eyeshadows. Although I did have to wait a few weeks for them to come back in stock as they sold out so quickly. 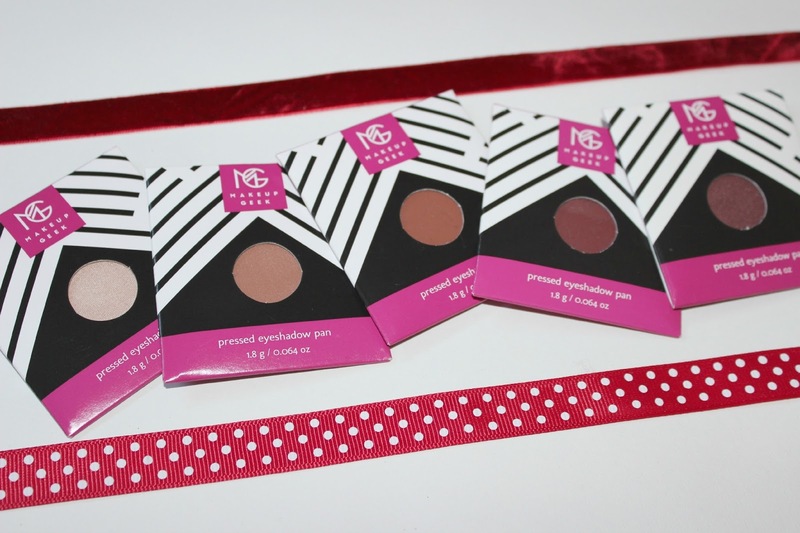 BeautyBay restock the Makeup Geek products every couple of weeks, so you have to be quick when they get restocked. I was like a kid at Christmas waiting for these to be delivered as they've been raved about so much on YouTube and are often compared to the Mac Cosmetics eyeshadows. These eyeshadows are out of this world and I can't believe the quality of them for the price. Each of these eyeshadows are just £4.95 a shadow and they come in pan form. Shimma Shimma is described as a metallic champagne and it certainly is. I've been applying this one to the inner corner of my eye (without irritation) and it looks great when used as a highlighter on the rest of the face too. This is one of my favourite eyeshadows that I've purchased and it's taken over my last favourite, which was Mac - Nylon. This eyeshadow is super pigmented and so buttery. There's nothing worse than chalky eyeshadows. Frappe is a matte warm medium brown shade that is a beautiful for an everyday transition shade. I really like this shade. The pigmentation is good and the product is creamy, but it's no Cocoa Bear. 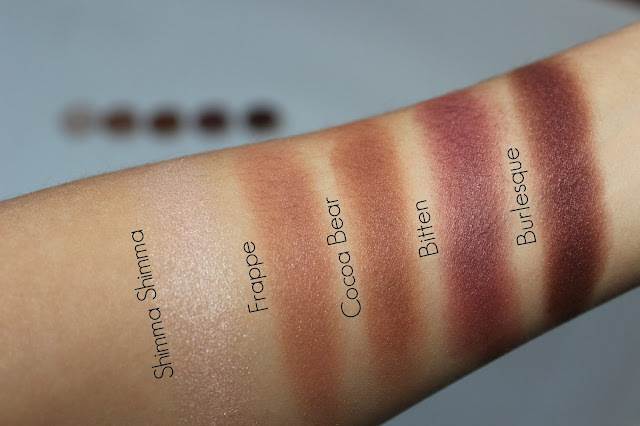 Although they look quite alike in the swatches above, Frappe is a lot lighter than Cocoa Bear and you do have to layer this one up for a more intense colour pay off. I like to use Frappe in the crease of the eye and then I go in with Cocoa Bear. Cocoa Bear is a matte warm toned red brown. This is my all favourite out of the eyeshadows that I bought. I like to use Cocoa Bear as a transition shade when I want to do a smokey eye or give them that extra definition to make the eyes look more intense and warm them up a little. This eyeshadow is again very pigmented and creamy, such good quality for the money. Cocoa Bear was so hard to get hold of, it went out of stock twice before I could order it! It's just one of those must have eyeshadows, I honestly don't know what I'd do without it now. Bitten is a matte brown red shade so if you're looking for the perfect matte burgundy eyeshadow?! Look no further! You will love and need this one within your eyeshadow palette. Bitten has great colour pay off and it is the perfect shade for fall. I've fallen in love with the colour of this one so much. I can't wait to create a a vampy eye with this one. This one was also hard to get hold of so if it's in stock go, go, go! Burlesque is very similar in colour to Bitten, although it is a little darker. Is more of a purple, burgundy, brown? And it has a satin/metallic finish. This shade is going to get used a hell of a lot throughout the Christmas period. Can I rock a dark smokey eye all day err'day? This looks gorgeous all over the lid paired with a nice matte black to create a gorgeous smokey eye, don't forget to add some winged liner though. You can see just how pigmented it is on the swatch above, in fact you can see just how great they all are. I can't wait to create an eye look for you with some of these eyeshadows and I've already got a list of other eyeshadow shades that I want to purchase from MUG. They do a great black called Corrupt that appears to be the darkest black matte shadow I've ever seen. I can't wait to purchase some more already! Also if you wish to use these in your Mac Cosmetics palette you'll need to purchase some magnets, you can get them really cheap off eBay or Amazon. All the good ones were sold out by the time I got to the website. I need to be quicker on the uptake - they look so good!! I love the shades that you picked! I heard these are so good ! These look gorgeous! Nice review.